Holiday party season is nearly upon us and I, for one, am VERY excited! Hosting is one of my very favorite things because I love spending time with my friends or family, and I also love to cook (mostly because I love to eat). Ha. This post is sponsored by Frito-Lay. The recipe is a super easy-to-make appetizer: mini baked potato chip crab cakes. 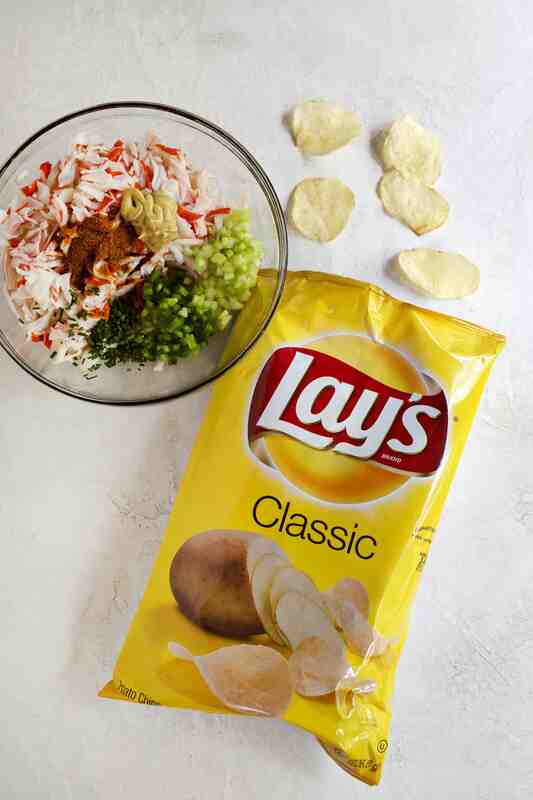 I used Lay’s Original potato chips in these crab cakes, and I love the salty crunch along-side the other ingredients. 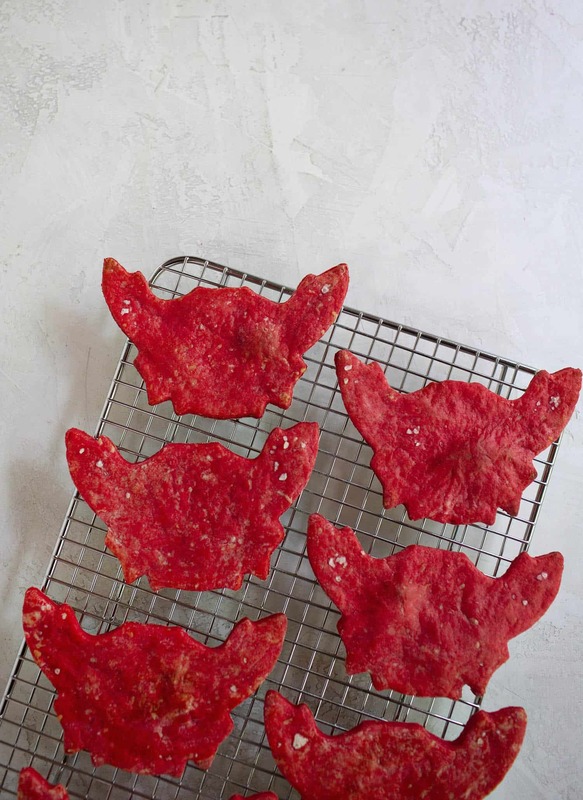 Plus, this appetizer gets bonus points because it’s not only delicious but they are sort of adorable too. I never thought I’d say that about a crab cake, but there you go. 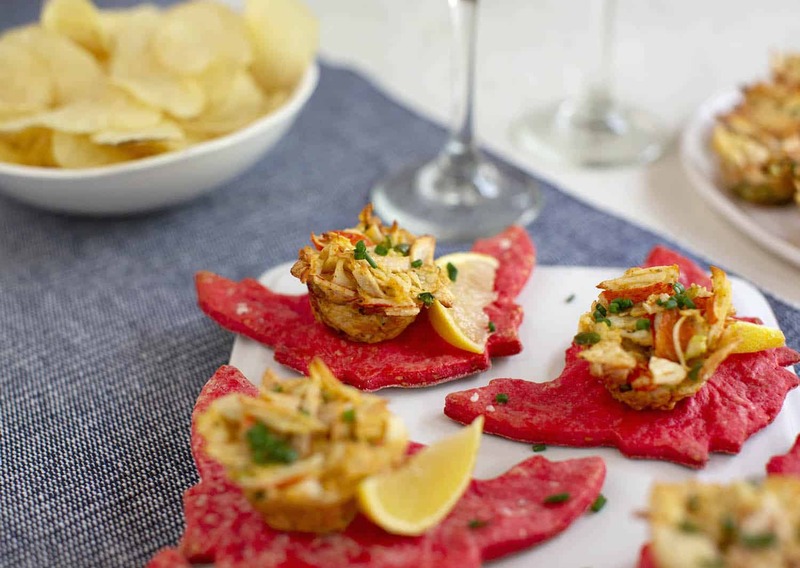 I used imitation crab meat for this recipe, but I’m sure real crab meat would work well too. Being mostly vegetarian (and also located in the Midwest), imitation crab is just a bit more accessible for me, and these will turn out tasty either way. 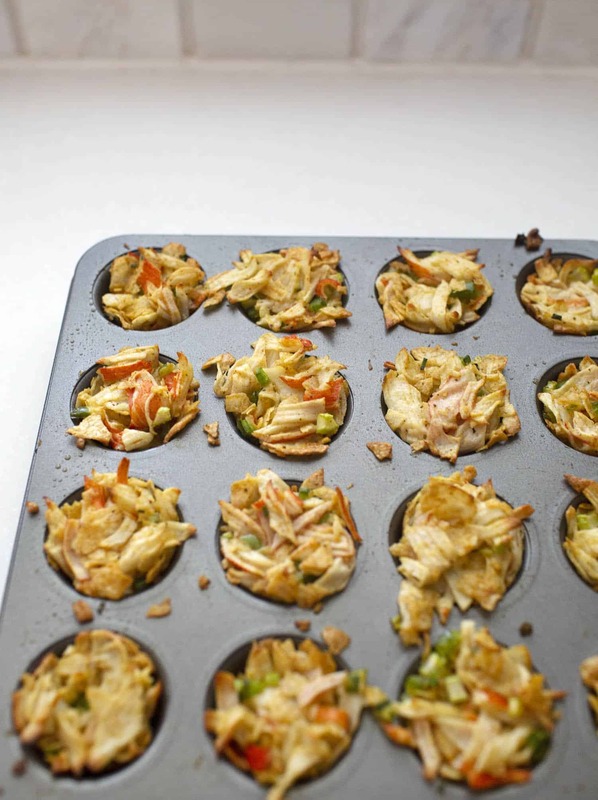 After mixing the ingredients, you simply press them into a greased mini muffin pan, bake, and you’re done! You could easily make the mixture ahead of time and then bake the day you plan to serve these. 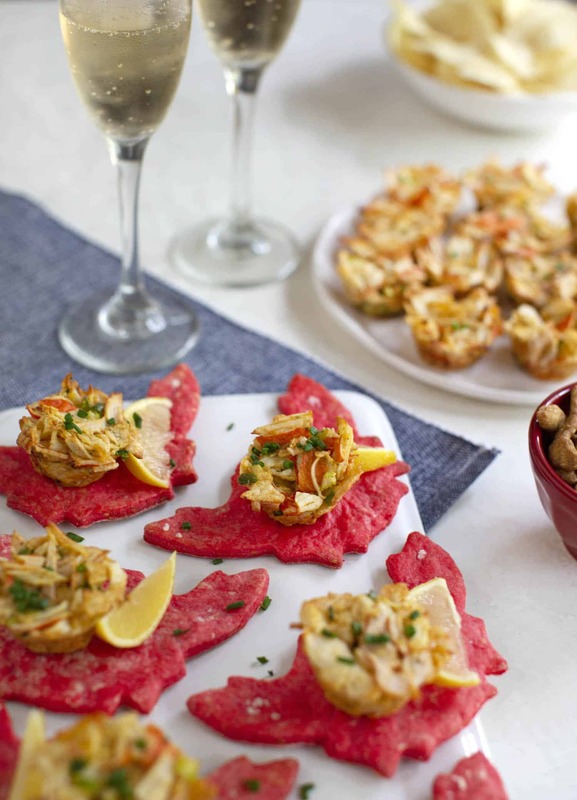 Now, I choose to really dress up these mini crab cakes by baking my own cheese crackers (shaped like crabs) to serve on. I’ll share the recipe for that in case you want to go the extra mile, but it’s totally not necessary. These mini crab cakes will pop right out of the pan and sit nicely on a serving dish until guests pick them up to enjoy. So you do not need the cracker, but it’s kind of fun, right? And hosting should be fun. If you are making the crackers, you can make those up to a few days in advance if you store in an airtight container. In a medium size mixing bowl, stir together the flour and grated cheese. Grate the cold butter into the bowl and use a fork to mash until the mixture is like small pebbles (similar to making pie crust). In a small bowl, stir together the milk and red food dye. Pour the milk into the mixing bowl, with the flour/butter mixture. Stir until a dough ball begins to form. You may need to use your (clean) hands to mix some. 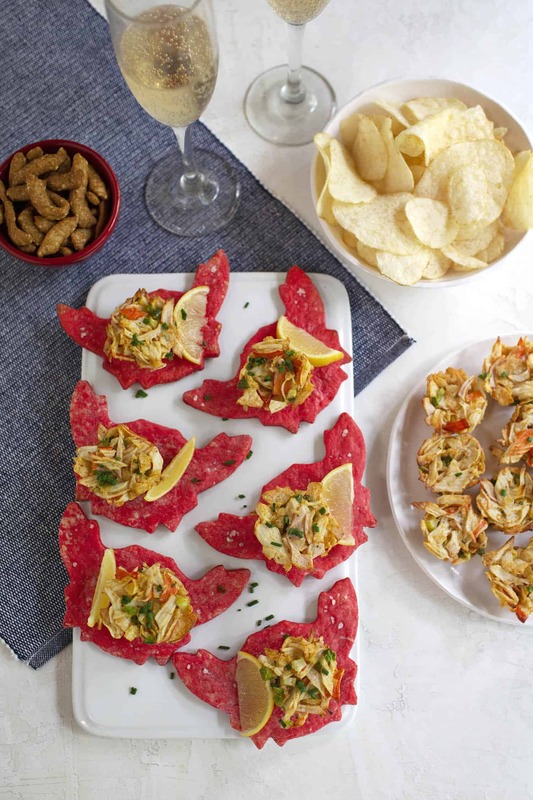 Roll out and use a crab shaped cookie cutter to cut the crackers (or you can do a simple shape like squares or triangles if you prefer). Bake at 400°F for 12-15 minutes. Allow to cool before using or storing. For the crab cakes, finely chop the jalapeño (removing the seeds) and celery. In a large mixing bowl, flake the imitation crab meat after draining. Then add the jalapeño, celery, 2 tablespoons of chives, dijon, seafood seasoning, and eggs. Stir well. Then stir in the crushed potato chips. Lightly butter, or spray with non-stick cooking spray, a mini muffin pan. Press the crab cake mixture into the pan. Bake at 400°F for 18-20 minutes. Allow to cool slightly and then you can remove the crab cakes from the pan. 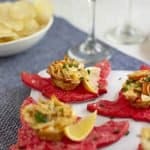 Serve on a serving tray or on top of the crackers garnished with more chopped chives and a lemon wedge.